Add a frightfully beautiful touch to your Halloween decor with our glittered black rose bouquet. Perfect for adding flair to any Halloween event, formal masquerade dance, as guest party favors, gothic haunted house decor, or use as a costume accessory! 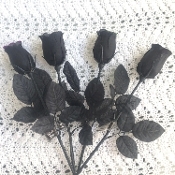 18-inch (45cm) Black plastic color long wire stems with realistic fake thorns, and black poly silk buds and leaves, can be arranged or bent in many witchy shapes to suit most craft applications. 3 stems are each adorned with different green, silver or purple glitter (One of each color) tipped buds, plus 1 unadorned Black stem for a formal deathly touch! Made of plastic, wire and cloth. Add some fake spiders, webbing, red paint or faux blood for a truly gruesome centerpiece! FOUR (4) Pieces per SET. - FOUR (4) Individual Long Stemmed Rose Pieces per SET.